The Go-Go’s will forever have the beat! After breaking onto the Los Angeles music scene in 1978, the multi-platinum, all-female American rock band still rocks over three decades later. The Go-Go’s made history as the first, and to date only, all-female band that both wrote their own songs and played their own instruments to ever top the Billboard charts. Today, their live show continues to deliver every bit of the raw energy of their now-legendary punk beginnings, tempered with the wisdom of years of pop perfection. This summer 2014, The Go-Go’s will return to the famous Hollywood Bowl, which is celebrating its 15th anniversary, to be inducted into the Hollywood Bowl Hall of Fame, joining other luminaries such as Stevie Wonder, Frank Sinatra, John Legend, Liza Minnelli and others. The group made its first appearance at the Hollywood Bowl in the summer of 1982, and more recently, they performed 30 years later at the Bowl in 2012. Additionally, this summer, the iconic 80s rock band will also headline the ultimate 80s music experience, the Replay America tour, which kicks-off on July 5th in Clearwater, FL., and also features Patty Smyth of Scandal, Martha Davis and The Motels, Cutting Crew and Naked Eyes. The Go-Go’s rose to fame during the early 1980s after the release of their 1981 debut album, Beauty and the Beat, which was #1 on the Billboard charts for six consecutive weeks, selling three million copies, and making it one of the most successful debut albums of all time. The album, which went triple-platinum in the US, was also on Rolling Stone’s list of “500 Greatest Albums of All Time” and it featured their hit singles “Our Lips Are Sealed” and “We Got the Beat.” The first single, “Our Lips Are Sealed” has also been named one of the “Top 100 Pop Singles” by Rolling Stone. In 1982, The Go-Go’s were nominated for a Grammy Award for “Best New Artist” and the group also released their sophomore album, Vacation, that same year, which was certified Gold in the US and spawned another top 10 US hit with the title track. Two years later, The Go-Go’s released their third album, Talk Show, which is celebrating its 30th anniversary this year, and featured US Top 40 hits “Head over Heals” and “Turn to You.” During this time, The Go-Go’s became the foundation of the early 80s pop-rock sound and were a pop phenomenon, while having a lot of fun and blazing a brand-new trail -- for the DIY ethic in general, and women in music in particular. They appeared on TV shows, in movies, on the cover of Rolling Stone magazine and headlined high-profile concert tours…The Go-Go’s became certified rock stars. Having accomplished more in just a few years than most bands could ever imagine, The Go-Go's were inactive for the last half of the 80's, with each member busy with solo projects and real life. The group’s legacy was rekindled in the 90s when The Go-Go's reunited for a charity show and in 1994, the group released the 2-disc retrospective album, Return To The Valley of The Go-Go's, which featured three new recordings. In 2000, their raucous and rocky off-stage history, often re-told and colorfully embellished, was documented in a very popular episode of VH1’s “Behind The Music.” The VH1 special was accompanied with a greatest hits collection album, Behind The Music: The Go-Go's Collection, which continues to be a strong-selling catalog item for the band. 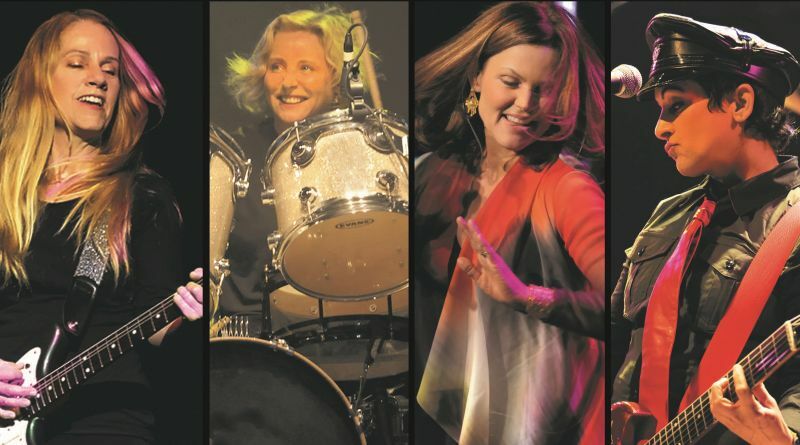 After the VH1 buzz, the rock band released a new album, God Bless The Go-Go's, in 2001 and hit the road on a US tour, which was later immortalized in a DVD, “Live In Central Park.” In 2011, thirty impressive years after their debut album Beauty and the Beat was released and dominated the charts, The Go-Go’s were honored with a Star on the world-famous Hollywood Walk of Fame.